Dr. Martin Fischer’s research focuses on exploring novel nonlinear optical contrast mechanisms for molecular imaging. Nonlinear optical microscopes can provide non-invasive, high-resolution, 3-dimensional images even in highly scattering environments such as biological tissue. Established contrast mechanisms, such as two-photon fluorescence or harmonic generation, can image a range of targets (such as autofluorescent markers or some connective tissue structure), but many of the most molecularly specific nonlinear interactions are harder to measure with power levels one might be willing to put on tissue. In order to use these previously inaccessible interactions as structural and molecular image contrasts we are developing ultrafast laser pulse shaping and pulse shape detection methods that dramatically enhance measurement sensitivity. Applications of these microscopy methods range from imaging biological tissue (mapping structure, endogenous tissue markers, or exogenous contrast agents) to characterization of nanomaterials (such as graphene and gold nanoparticles). The molecular contrast mechanisms we originally developed for biomedical imaging also provide pigment-specific signatures for paints used in historic artwork. Recently we have demonstrated that we can noninvasively image paint layers in historic paintings and we are currently developing microscopy techniques for use in art conservation and conservation science. 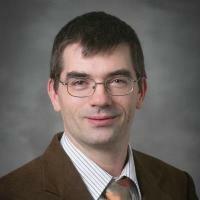 Fischer is an associate research professor in the Department of Chemistry. Associate Research Professor Martin Fischer is the technical lead for the ALIS facility. Graduate student Jun Jiang holds a B.S. in optoelectronics from Tianjin University in China, and a M.S. in Biohpotonics from Hong Kong University of Science & Technology. Neurobiology graduate student Jun Jiang is an integral part of building the facility experimental instrumentation.